Having stayed in a couple of HI hostels now, I’ve come to expect a certain quality. And DC’s HI certainly lives up to these expectations. Announcing itself with a huge sign hanging in the side if the building, it is immediately recognisable as part of the HI brand, even though each one is unique in their own way. The hostel is situated only a few blocks from the city’s main attractions and sightseeing spots, meaning you can walk to almost anywhere you want to go. It also has a main metro stop just down the road that will take you directly to and from the airport. Upon arrival and check-in, the staff were welcoming, friendly and helpful, full of information about the city and the hostel itself, telling us about the facilities and amenities it offers, including the free breakfast (which is actually really good) and fantastic communal kitchen. Right next to the check-in desk is the main lobby, with comfy sofas, a pool table, pay phones, and computers (there is of course also free wifi throughout the hostel), as well as a library/reading room mostly full of travel guides. The rooms are what I’ve come to expect from an HI hostel, clean and spacious, with comfortable beds (bunk style) and lockers to put your belongings in. As normal, the rooms range from 6 to 10 bed, in either male, female or mixed and private rooms are also available, albeit for a slightly higher rate. The bathrooms too are equally great – separate for boys and girls, they are clean, always in working order and the showers are some of the best I’ve used all summer. But the best part of this hostel, in my opinion, is the TV room, a room just off the dining/kitchen area on the 2nd floor with a 60″ television, DVD/VHS (yes, video tape) player and around 20 big and extremely comfortable leather armchairs. It’s a fantastic place to just sit and chill after a hard day’s sightseeing, watch some rubbish tv or stick on a movie, an absolute luxury when you’ve been travelling for a while. It’s also a good way to meet other people staying in the hostel, especially when trying to make a choice about what film to put on! 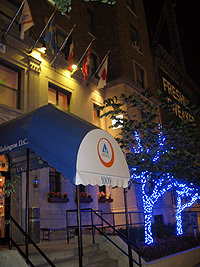 So all in all, it’s a great hostel, probably one of my favourites so far on this trip, and if I’m ever in DC again, I’ll definitely be returning.